One of the most emblematic representations of Porto’s history and culture are those beautiful tiles we see all over the city which are known as azulejos. Azulejo tiles in Porto come in different colors, but most commonly, they are in white and blue. So what is the history of azulejo tiles? 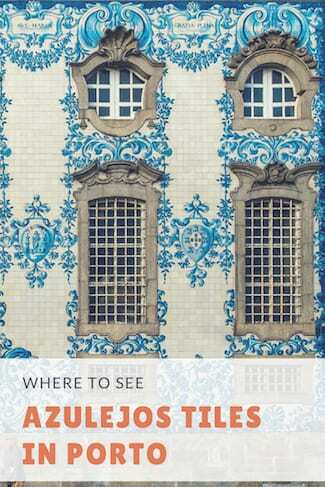 Where are the best places to see azulejo tiles in Porto? And where can you buy them? Let’s find out! It was King Manuel I of Portugal who brought azulejo tiles from Seville, in Spain, to Portugal, during the 15th century. Azulejos were very common in parts of the Iberian Peninsula dominated by the Islamic Expansion during the middle ages. Indeed, the word azulejo comes from the Arabic word al zellige which means “the polished stone”. © Quase Bart. 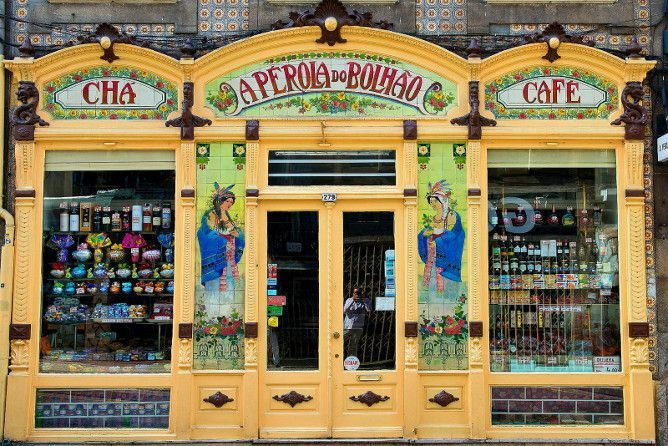 Pérola do Bolhão, a traditional grocery store in Porto (1917). Portugal imported its azulejos tiles from Spain, Italy and Holland until the Portuguese mastered the art during the 16th century. In Portugal, the art has developed its own forms, changing from being just geometric shapes and flowers to something that tells stories, mostly of religious nature. Indeed, azulejo tiles in Porto are a great example of how different cultures and eras can give life to something so symbolic and so beautiful. 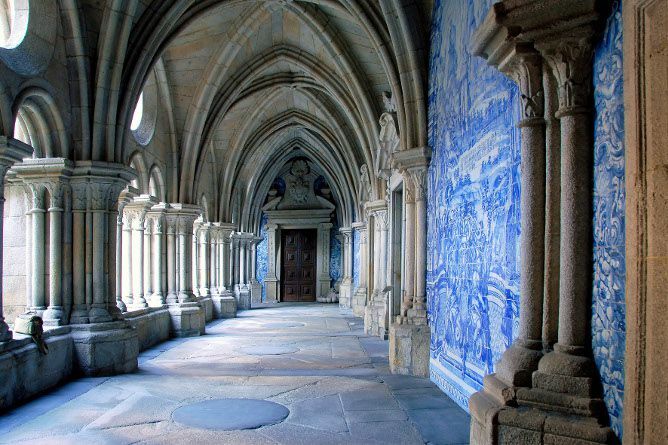 Within the dark and gothic cloisters of Porto’s cathedral, you can’t help but be taken back by the blue and white work of the azulejos art. 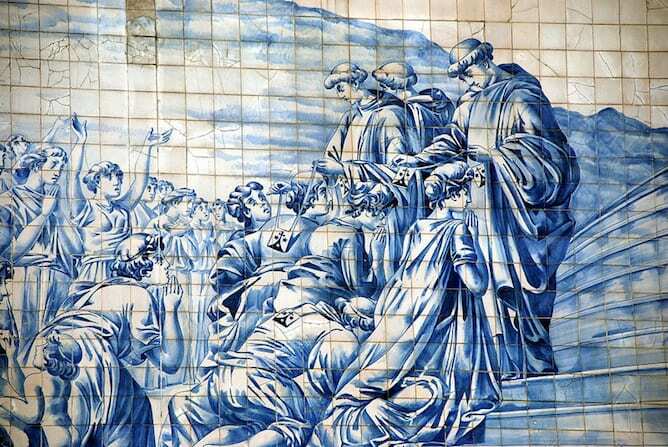 It took researchers some time to discover who was the true artist behind the 5.56m by 3.50m Sé azulejo tiles in Porto. And after looking at shipping documents, they realized there was a high volume of azulejos ordered from Mocambo, Lisbon between 1729 and 1731. 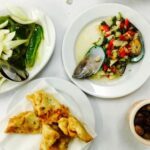 Mocambo neighborhood which is now called Madragoa in Lisbon is known to be one of the first places to have pottery and ceramic ovens. With that information in mind, the art has been attributed to painter Valentim de Almeida because his name came up in the shipping documents and he even lived in Mocambo neighborhood. The painting was inspired by the Song of Solomon from the Old Testament which gave researchers an idea about the political and religious climate when the piece was painted. How to get there: take the subway to São Bento station. Sé do Porto is a 5min walking distance. We’ve written about the history of São Bento Station and the stubborn ghost that hunts it. Indeed, visiting São Bento Station is one of the top things to do when you’re in Porto. 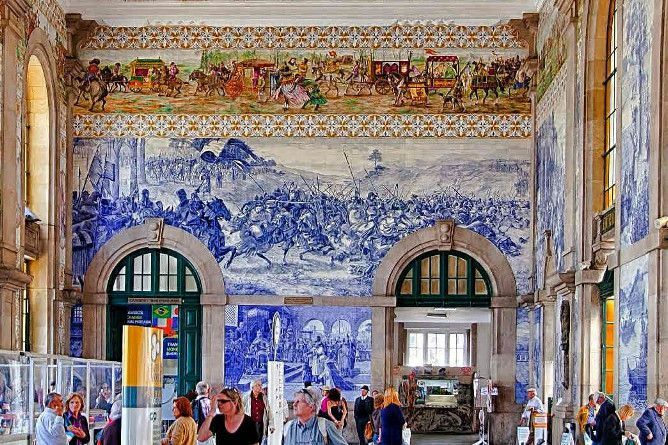 Upon entering the station, you’ll see the extraordinary hall covered in 20,000 azulejo tiles in Porto, courtesy of Jorge Colaço. Colaço’s work, which covers an area of 551 m2, is truly one of a kind. The tiles tell a story as if we’re being transported through time. Jorge de Colaço wanted to depict important moments of Portuguese history (mostly the foundation of the Portuguese kingdom and the Portuguese overseas empire) as well as daily life moments from the North of Portugal. But within the São Bento train station you can also find the seasons of the year, professions and muslim inspired azulejos tiles. How to get there: take the subway to São Bento. The railway station is a 1min walking distance. Igreja do Carmo is not only one of the best places to see azulejo tiles in Porto, but it’s also one of the most beautiful churches in town. This 18th century baroque church had its tiles installed in 1910. With intricate details in blue and white colors, the painting was designed by Silvestre Silvestri and painted by Carlos Branco. The illustrations refer to the founding of Carmelites religious order on Mount Carmel. 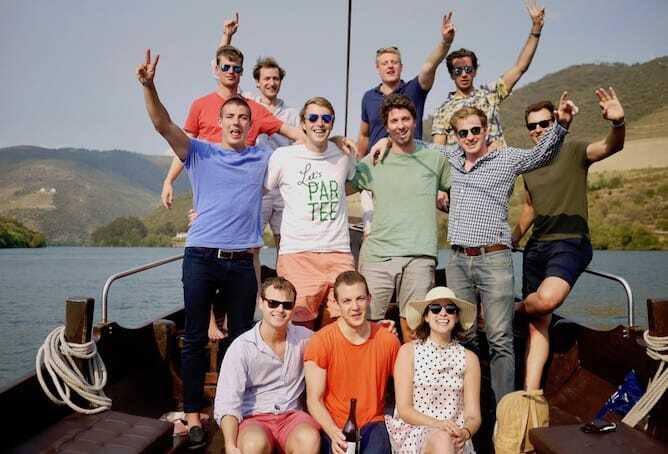 How to get there: take the subway to Aliados. 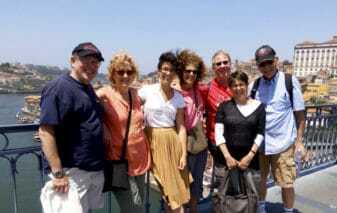 Igreja do Carmo is an 8min walking distance. 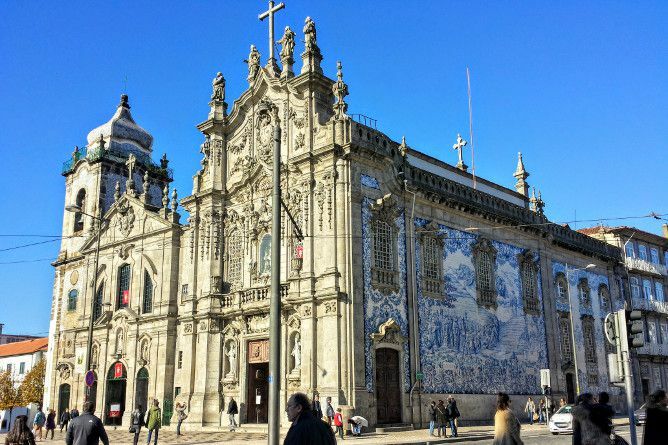 Capela das Almas is a chapel located in one of the most important commercial streets in Porto. It also sits next to Bolhão subway station which was designed by the famous Porto architect, Souto de Moura. 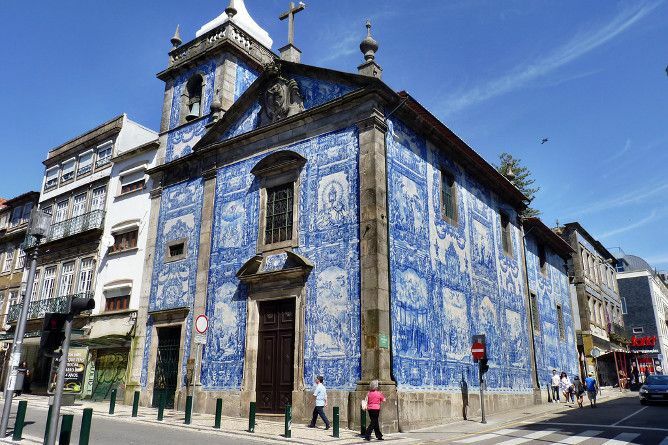 This chapel is a great example of the use of azulejo tiles in Porto during the 19th and 20th century. 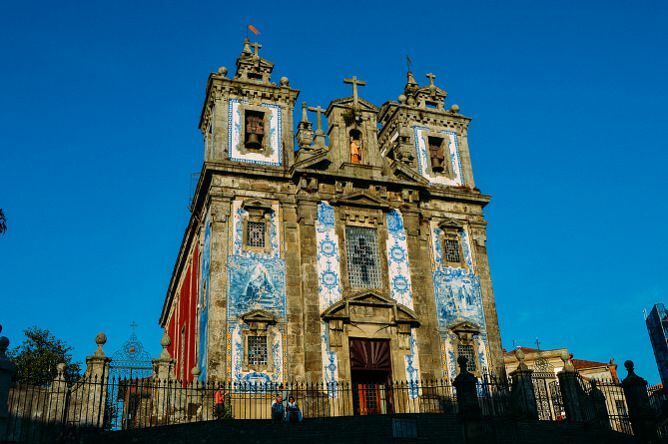 During those times in the North, especially in Porto and Aveiro, it was common to use azulejo tiles with religious figures on the exterior of churches. The paintings portray the life of St. Catherine of Alexandria and St. Francis of Assisi, as the chapel is devoted to them. How to get there: take the subway to Bolhão station. 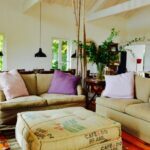 Capela das Almas is a 1min walking distance. Santo Ildefonso is an underrated place to see azulejo tiles in Porto. 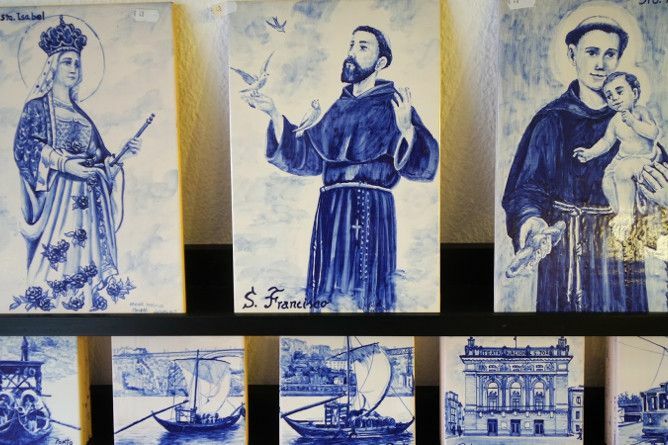 The artist behind the 11,000 tiles covering Santo Ildefonso church is Jorge Colaço, the same man behind the São Bento Station tiles. Even though this baroque church was built in 1739, the tile work was on the exterior was only done in 1932. The art represents the life of Saint Ildefonso and images from the gospel. How to get there: take the subway to São Bento. Santo Ildefonso church is a 7min walking distance. 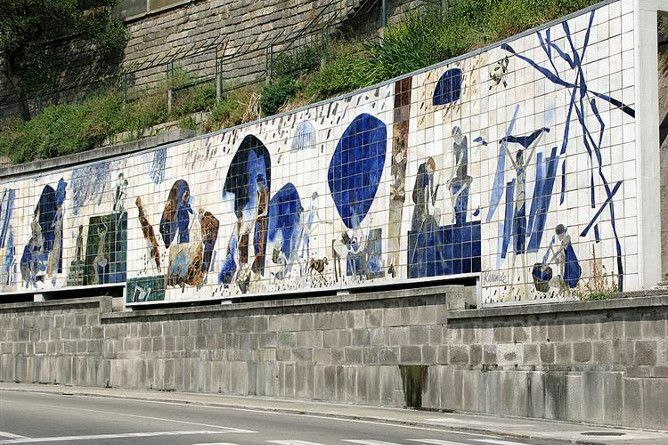 This 40 meters long canvas by Júlio Resende (1917 – 2011) is considered one of the best example of contemporary azulejo tiles in Porto. In 1987, the painting was created on 40 pieces of ceramic and can be found at the Ribeira tunnel entrance. Resende’s painting was dedicated to his hometown, Ribeira. It depicts “the magnificent history of misery and grandeur of the population living along the waterside in Porto.” (Nasoni Gallery, 1989). How to get there: take the subway to São Bento. 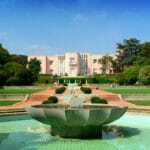 The panel is a 10min walking distance. 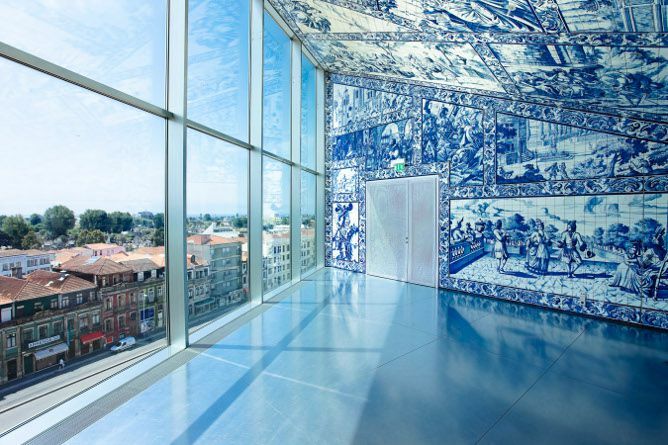 An unusual, but equally interesting place to see azulejo tiles in Porto is in Casa da Música. Rem Koolhaas, the Dutch architect behind the contemporary building, created the VIP room as an attempt to merge two cultures together; the Dutch and the Portuguese. The style of the tile painting resembled that of the 16th century tile art in Portugal and the European Renaissance. From outside the building at night, you can see into the VIP room with its amazing tiles. How to get there: take the subway to Casa da Música. The building is a 5min walking distance. At one of the top historic places in Porto, you can find Banco de Materiais, also called the Bank of Materials. Banco de Materiais is a concept that was created by Porto’s local government in 2010. The idea was to preserve and display many of Porto’s decorative and construction pieces that tell the story of Porto and its architecture. It also aims at helping building owners to be able to restore their beautiful azulejos tiles facades in the city. 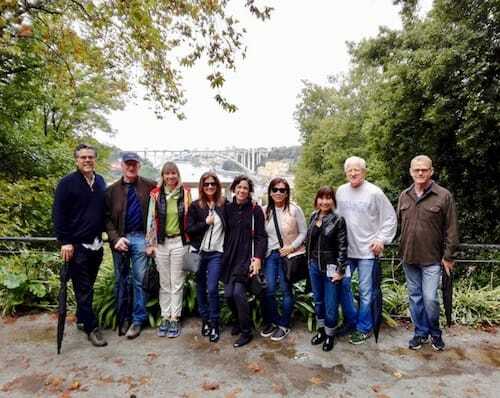 At Banco de Materiais you’ll find many azulejo tiles, iron pieces and decoratives stones that used to be on the facades of Porto’s buildings, and hence visiting this place is a journey into the past. If you love history and want to see more azulejo tiles in Porto, you’ll enjoy this place. How to get there: take the subway to Aliados. Banco de Materiais is a 7min walking distance. 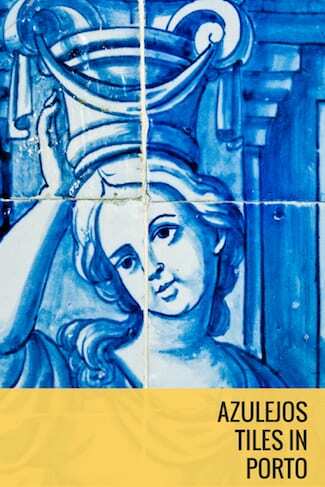 Where are best places to buy azulejo tiles in Porto? Before we jump into the topic of buying azulejo tiles in Porto, there’s something our readers should know. When shopping, always ask for the source of the azulejos. Unfortunately there are some unscrupulous salespeople that sell azulejos tiles that have been stolen from private property or even from monuments in the city. 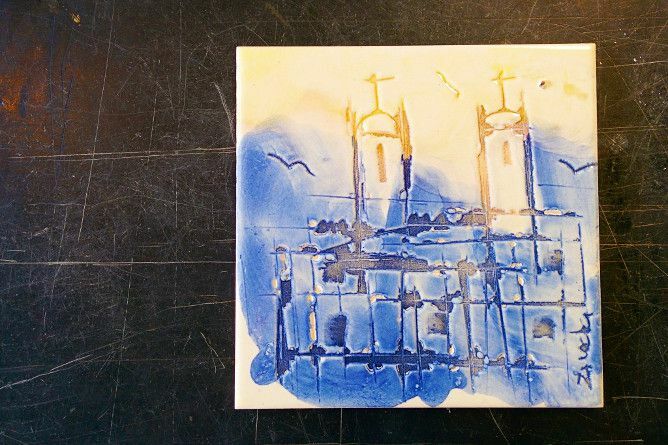 The best option is to go for handmade azulejos tiles that have been painted by local artists. This way you can assure that your purchase is not lapidating the local patrimony. 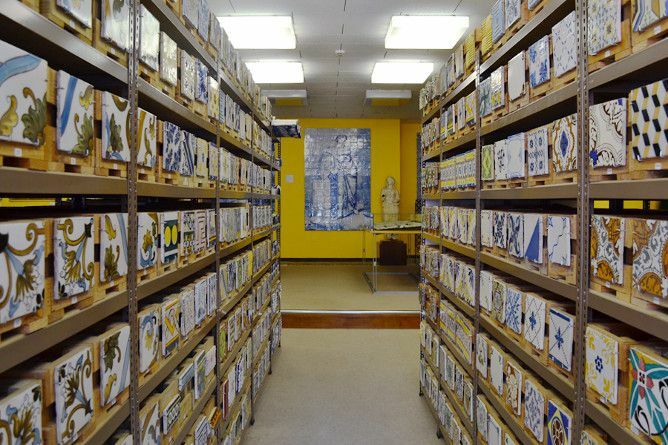 Prometeu Artesanato is one of the best places to buy azulejo tiles in Porto. It’s a store that took a traditional art and turned into something new and creative. Its azulejos tiles are made and painted in-house. They carry the old-school geometric tiles, the religious figures’ tiles and some funny tiles that would make a great gift – like a cat drinking wine! Watch this video to see how azulejos tiles are made in Prometeu Artesanato. How to get there: take the subway to São Bento station. Prometeu Artesanato is a 5min walking distance. Near the Stock Exchange Palace and Ferreira Borges Market, you’ll find a cute little ceramic store by artist Adosinda Pereira. Adosinda has a degree in Heritage Historical Sciences and she’s been working with ceramics since 1990. 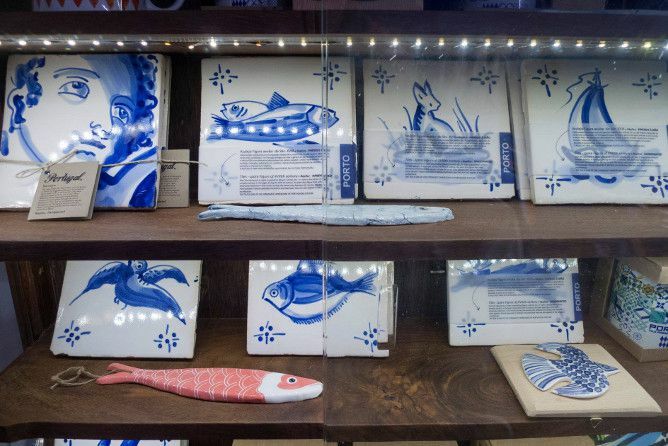 In the store where she develops her work you can find some of the most unique azulejo tiles in Porto. Her technique with ceramic and azulejo tiles is something I have never seen before. So if you want to buy some azulejo tiles to remember your visit to Porto, Zinda Atelier is a great place to shop. How to get there: take the subway to São Bento station. Zinda Atelier is a 7min walking distance. I think the best way to learn about azulejo tiles in Porto is to make some yourself! 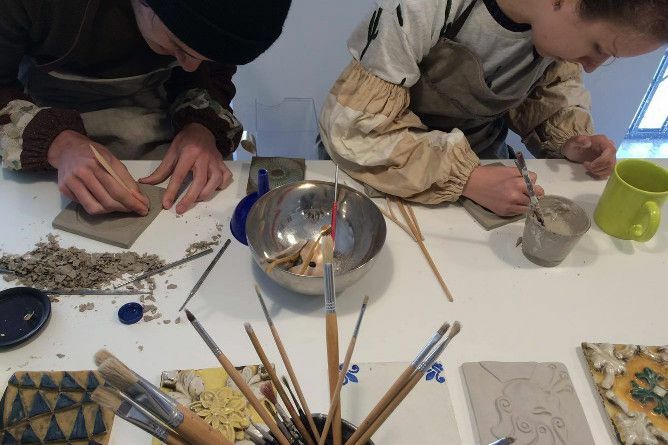 Brâmica has great workshops taught by people with over 20 years of experience. 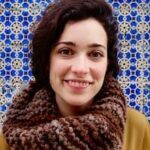 Not only will you be learning how to make azulejo tiles, but you will also learn about their history. This is a great place if you want to make a special gift for someone or if you want to make your own souvenir. 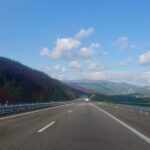 This will make a great couple’s activity and it will even be a fun activity for kids. How to get there: take the subway to Marquês. Brâmica is a 9min walking distance. Warning! Upon entering this store, you will not want to leave! This creative design and craft store is full of ceramics and handmade items that will make a great gift. They also have one of the most beautiful collections of azulejo tiles in Porto. Some of their tiles come wrapped with additional items like hand-made soap, and some have facts written on them which is a nice touch. I know many people come to Centro Comercial Bombarda because they have some of the best restaurants in Porto for a low budget, so this is a nice excuse to stop by Azul Cobalto for an inspiring azulejo shopping experience. How to get there: take the subway to Aliados. Azul Cobalto in Bombarda shopping center is a 13min walking distance.